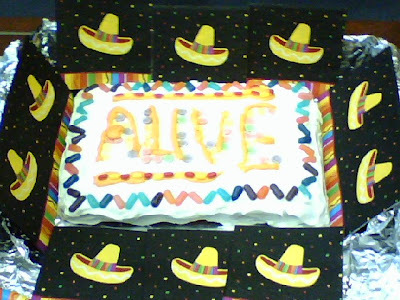 This cake and the guerilla party I held in the hospital lobby to celebrate the 45,000,000 people at risk for suicide who will survive it, the same hospital whose psych ward I hope never to call home, definitely come out of the "Prozac Monologues" spirit. So does the grammar of that last sentence. I have a fantasy that next year the Psych Department itself will host the party for Suicide Prevention Week, with both Emergency Room workers and the patients, out on a pass, sharing the honor. For sure, the hospital-catered cake will look better. YES, we deserve a Party, when we're able to keep the gremlins at bay and survive and are ALIVE. Hurray, Meg! You are one of my heroes. 45,000,000 success stories. We have to find a way to tell them. Unfortunately, a closer reading of the submission guidelines for cakewrecks.com indicates that my submission is ineligible. While BCBS, Cigna and I have all paid dearly for the life lessons, nobody actually paiod ME for the cake. So this was not a case when "professional cakes goes horribly, hilariously wrong." I am almost laughing too hard to comment but I will. I can just imagine that on night I was brought up from the ICU to the psych ward -- what IF that guy with red beard (a very kind guy actually) had been standing there grinning behind the glass waiting for me with a cake? One decorated with roses and a whole new set of meds? I was shaky enough as it was, but whoa...was this a hallucination on top of everything else? Heck, I'd have probably scarfed it right down. I was pretty hungry as I recall...Hope you had a good party.